Authored by epriestley on Mar 12 2019, 3:13 AM. Depends on D20277. Ref T10333. Put profile icons on "Group by Owner". Add a similar "Group by Author". Probably not terribly useful, but cheap to implement now. Add "Sort by Title". Very likely not terribly useful, but cheap to implement and sort of flexible? 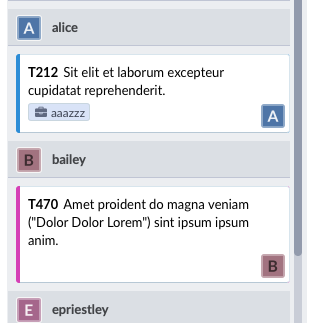 D20281 Make workboard sort-order inversions more clear by using "-1 * ..." instead of "(int)-(int)"
D20268 Add "assert_same_keys()" to "libphutil/"
D20266 Remove all readers/writers for task "subpriority"